Without Teresa I would not have had the confidence to plan for and pursue the choices that felt right to me for my son's birth. I had a serious psychological block about the idea of being immobile during labor and so knew I wanted to aim for an unmedicated birth. It was also important to me to have a lot of control over even very standard monitoring and procedures during labor, and to be able to focus my energy internally without a lot of commentary or interference. Teresa was *amazing* for all of this, and everything went just as I'd hoped. She came to our house at 5am after texting with my husband about updates as I'd been having regular contractions that got closer and closer together over the course of the night. She showed up full of positive and calm energy and encouraged me to rest and relax and move through the contractions as they occurred. We went to the hospital at 6:30am and I was already 7cm. I labored in the hospital throughout the morning and Teresa kept the whole scene at bay, communicating with me, my husband, and the nurses in a way that allowed me to be completely focused on my body and its processes. I was not always the picture of serenity to say the least but she was unflappable and totally encouraging the whole time. My son was born at 1:30pm after just 20 minutes of pushing - I was 100% thrilled with how labor had gone and cannot imagine doing it without Teresa's help. We also really appreciated the planning and educational meetings we had with her in advance. It made us more comfortable with her and helped us think through a plan. She also generously agreed to attend a meeting with my NP at my doctor's office so we could put some formal instructions in my chart. We just had our postpartum visit with her and everything is going well. We will always have a special place for her in our hearts and much gratitude for the whole experience. With Teresa by our side, we made possible what seemed, at times, impossible: to welcome our son in a beautiful, unmedicated vaginal birth! When at 36 weeks we found out that our son had turned head up, Teresa showed us exercises to help him turn, encouraged prep work (chiropractic, acupuncture) and researched the various delivery options for us. She was always there to answer questions, to calm our nerves and support us in any possible way. A pivotal point for us was when Teresa offered to attend the version attempt. We were nervous as we were told, that, if the version failed, we would have to schedule a C-section, which we felt very uncomfortable with. Teresa was terrific: not only did she put us at ease during the attempts by guiding my breathing and encouraging me, she also advocated our interest in a vaginal breech birth after the version attempts failed. While we started seeing an OBGYN who is experienced and extremely skilled in vaginal breech deliveries, Teresa did an enormous amount of research for us, helping us to feel confident with our decisions (and also be comfortable with Plan B, a family-centered C-section). A few weeks before my due date we were able to meet Susanna, who is a certified midwife and works as a back-up doula for Teresa. We felt extremely comfortable with Teresa and Susanna, who both are extremely skilled and knowledgeable birth workers. A few days later (10 days before my actual due date), I went into labor, which progressed so rapidly and smoothly that we almost didn’t notice that this was the REAL thing and our son well on his way. We called an ambulance, Teresa met us at the hospital and, before long, I delivered our beautiful, absolutely healthy baby boy – feet first. In hindsight, the prep work, the research, and learning to listen to our gut feeling to make the right choices - all of which Teresa encouraged - gave us the best and most empowering birth experience. Thank you, Teresa, we are forever grateful! I'm so glad we had a doula for our second birth and was happy with Teresa. With my first birth, I didn't have the gentle unmedicated experience I wanted; I felt bullied by the hospital staff, unsupported, frustrated, and unhappy. I was glad to have my son, but the experience left scars. My second birth was much better and vastly different. I was able to labor at home on my own and with my husband's support, for a long time. We actually stayed too long, and there wasn't time for Teresa to help me labor. By the time we finally called her, we had to leave. We, with Teresa, raced to the hospital in late labor in the car! I was 10cm when we got to the hospital; our daughter was born less than 30min later! My labor was unmedicated and it was a redemptive experience that healed old scars. Teresa is a calm presence. There were huge benefits to having her part of our prenatal and birth experience. She's down to earth. Upon meeting her, we felt that she was easy to talk to and nonjudgmental. She's sweet and would bring us treats from her garden. Having a sounding board for our past experiences and fears and hopes for labor was invaluable and it contributed to our success. 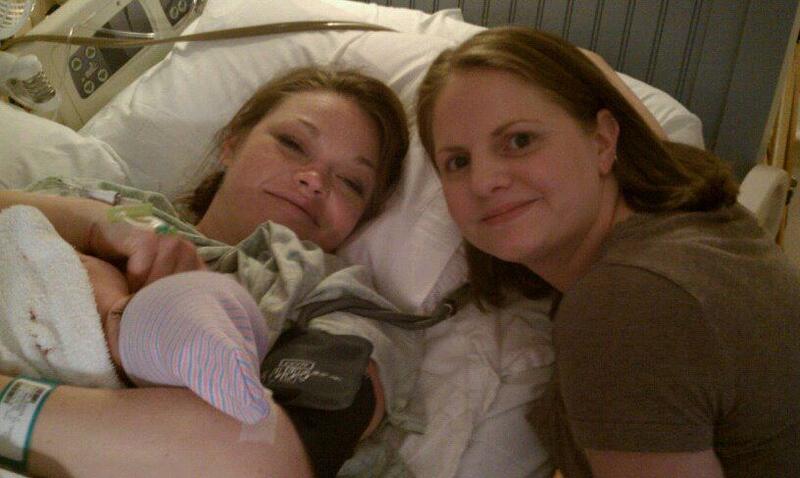 My daughter was breech and I went through many efforts to turn her, including a very painful (successful) ECV. Teresa was helpful in suggesting techniques for turning the baby: inversion, rebozo sifting, and acupuncture. She was very supportive during a stressful time, checking in regularly to see how I was doing. Her presence was comforting. She was supportive and calming when the midwife had some difficulty stopping my bleeding. She was friendly and deferential to the staff, but knew her way around the hospital. I'm grateful she was part of our birth. We'd absolutely recommend her. Teresa gave us a lot of confidence that helped make a better experience. First let me say that my wife and I are so glad we had Teresa with us before, during, and after the arrival of our son. Teresa is very good at what she does and her presence at the birth of our son was key to the positive experience both my wife and I had. We also took a semi-private hypnobirthing class with Teresa before our son was born and it was a great experience. Teresa knows a lot about birth, delivery, and HypnoBirthing techniques and she teaches and guides with ease, humor, compassion, listening, and openness. We highly recommend the course! My wife and I both felt immediately comfortable with Teresa when we first met to see if we would be a good match. She listened attentively and asked good questions of us, getting us thinking about what we hoped our birth experience would be. Although we had a positive experience overall, my labor and delivery process was a very long one, and had its difficult moments for sure. Teresa was there, either in person or by phone, the entire time (over two days) and made herself available even when we didn't need her right away. We both felt cared for and attended to by her. She helped to create a calm and natural environment, even in a highly medicalized hospital setting, and even the hospital staff noted how peaceful the room felt. Her calm presence helped us so much. She also asked good questions of the hospital staff and was not afraid to speak up, although she also took a back seat when necessary. She did a great job not only caring for me but also caring for my wife, making sure she was staying hydrated and nourished. Really, having her there with us was exactly what we hoped it would be and we comfortable and happily recommend Teresa to any woman and/or couple who are looking for support during their labor. Having Teresa as our doula was easily one of the best decisions we made around the birth of our daughter. I felt a connection as soon as we met her, and our first conversation assured me that she had both the scientific medical knowledge and the warm, intuitive people skills I was hoping to find in a doula. Each time we met with her, I felt calmer and more confident about my upcoming labor and delivery. She took the time to get to know me and quickly rooted out my insecurities about my body’s capability to give birth without interventions. More than anything else, those conversations with her helped me overcome my fears. When my labor proceeded much more quickly than we anticipated, it was the breathing and relaxation exercises she taught me that got me and my husband through it. And when Teresa arrived at my house to help us, she took one look at me and told us we had to get to the hospital right away. If it hadn’t been for her knowledge and expertise, our baby probably would have been born in my bedroom! She calmly and quickly helped us get to the hospital, where my daughter was born 19 minutes after we arrived in the delivery room. So even though I didn’t get to have her nearby for much of my labor, she was an absolutely invaluable part of my birth experience. I will always be infinitely grateful for her kindness, her know-how, and her generous spirit! I highly recommend Teresa for anyone giving birth! I was so scared of giving birth because of numerous posts I read online about how painful it is, how awful the recovery is and so on and so forth. I was literally mortified of giving birth and it is still funny to me how fast I changed my mind about it. Me and my husband attended Teresa's HypnoBirthing class at Mount Auburn hospital because I felt strongly about not using an epidural. After attending just the first class I felt so much more at ease about birthing and for the first time thought that maybe giving birth doesn't have to be so bad after all. We both liked Teresa a lot right after attending her first class because she is very knowledgeable, super friendly and has something so calming about her. The weeks went on, I enjoyed taking the classes a lot and would recommend it to anyone! It really opens your eyes and shows you how easy and peaceful giving birth can be. As the classes came to an end I felt completely calm and at ease about giving birth without an epidural and instead using the HypnoBirthing method but my husband decided to ask Teresa if she was available to be our doula. She was and this changed everything. Even though I thought I was at ease already, knowing that she would be there to attend our birth diminished even the last doubts I had. I was SO happy she was available for us and hiring her as our Doula was the best decision ever!! It was so nice knowing that I could text her any time, she always was there to respond very fast and even without me texting she always made sure to check in on me which made me feel very well taken care of. Teresa had quite a long way to our house but she never minded to come over. I would have never thought that I would ever have some stranger attend my birth but Teresa really didn't feel like a stranger. She makes sure to get to know you very well in a short time and it is very easy to feel comfortable with her. My labor progressed unexpectedly fast...I did not think I would make it to the hospital but Teresa was there to keep me calm and so we all ended up in the hospital right on time. It was the biggest relief knowing that she would be there waiting for me. Teresa did an amazing job at keeping me calm during labor and I truly believe there would have been no way for me to do it without her. My husband was there of course but even for him it was the biggest relief having her there to support both of us. I had the best birth I could ever ask for! It was very peaceful and having her there made all the difference! In the end you never know which midwife or doctor you will end up with but by hiring Teresa you will ensure that you have the most supportive person there that you can fully trust! I will make sure to hire her for my next birth as soon as I find out that I am pregnant just to make sure she's still available!! :) I can not emphasize enough- hiring her was the best decision and we all worked as a team making a beautiful birth possible that I am even missing right now! Who would've thought that one person can make you change so much in such a short amount of time! I went from being completely grossed out and anxious about birth to missing it and being sad that it's all over. Teresa is magic and born for this work!! My baby girl is now 6 weeks old, and as I look back on my birth experience, I remain ever grateful to have had Teresa Vittorioso-Fortin as a member of my support team. In my initial search, I sought a doula as I would a medical professional. After beginning my work with Teresa, I came to realize that working with a doula is so much more than a professional-client relationship, as she is involved in a highly intimate once-in-a-lifetime experience in a more personal way. Teresa exhibited the perfect balance of professionalism, friend-like supportiveness, and humor. Humor is important when preparing for childbirth. From the beginning of our working relationship, she listened closely to my preferences, and watched my husband and me attentively to get to know us as a couple. I now appreciate that childbirth is much more than simply pushing a baby out. My labor experience began with a day and a half of laboring at home. Teresa's support through this phase was critical. As a first time mother it would have been easy for my excitement to get the better of me. From the beginning, Teresa helped us to establish the tone and energy of our birth experience. It was important to us that my husband play a primary support role during the birth, so a major part of Teresa's work with us was to provide him with the tools necessary to be the best partner he could be. Without Teresa's sage advice throughout, I am certain the outcomes of our birth would not have been as overwhelmingly positive as they were. Without hesitation, I would do it all over again in exactly the same way, especially hiring Teresa. I will remain ever grateful that Teresa came into our lives. Our family was incredibly fortunate to have Teresa with us during the birth of our son this past November (2013). He was my second child, and after a long and challenging induction with my first I was facing another induction three weeks early and was nervous. I wanted to do hypnobirthing again and to find a doula who was familiar with the techniques and who could help bring me to a place of calm. Lucky for us, Teresa is a trained hypnobirthing instructor! Heading into the induction, my midwife thought it would be a quick birth because I was already dilated and almost entirely effaced. Almost 35 hours later, Teresa was still by my side, despite being six months pregnant herself! She led me through hours of affirmations and visualizations and literally poured water on my belly for five hours straight! She had the most peaceful, reassuring presence. My husband and I could not have felt more supported and in better hands than with Teresa, and are so thankful we were able to share the birth of our son with her. Teresa Vittorioso-Fortin is nothing short of amazing. I was astounded by her dedication, dependability and passion for her work as a doula and birth advocate. She is an incredibly warm and thoughtful person and I was impressed by her ability to read situations and know when her support was needed and when to step back and let others take the reigns. The birthing environment can be intense and Teresa manages all of the nuances with grace and ease. She always puts the mama and partner first and is a strong birth guide and natural leader. Although my experience did not lead to natural childbirth, Teresa provided such a tremendous amount of support, always advocated for me in time of need and gently reminded us of the various methods and birthing options at our disposal. Teresa truly helped to make this experience a great one and I will always be so thankful for her expertise and support! ​"​Teresa was amazing. My labor and delivery was peaceful and I wouldn't change anything!"